In 1937, Dr. Fumio Maekawa first described this plant from Japan and named it as a species, Hosta opipara. It was changed to cultivar status in The Genus Hosta by W. George Schmid (1991) and is correctly known as H. 'Opipara'. Subsequently, The American Hosta Society registered the cultivar on behalf of Dr. Maekawa in 2002. The plant forms a large size, rhizomatous mound about 19 inches tall by 40 inches wide. Its foliage is dark green in color with a creamy white marginal variegation. They are ovate-shaped, wavy and have above average substance. It bears medium purple flowers in August and sets viable seeds. There seems to be a lot of confusion over this fine hosta as evidenced by the following comments from The Hostapedia by Mark Zilis (2009). It appears that he is saying that H. 'Opipara' is actually H. 'Bill Brincka' but it could also be H. 'Koriyama' which could be H. 'Opipara Koriyama' which is the same as H. 'Mishima Fukurin Koba'...is that clear? 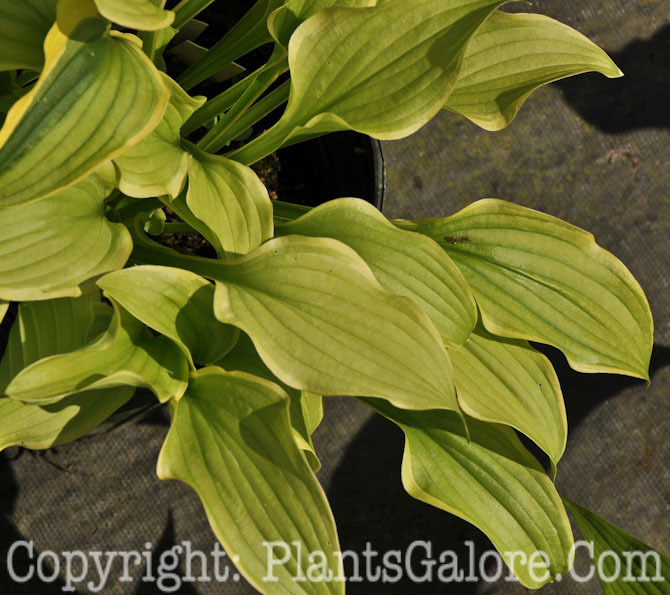 RE: H. 'Opipara' - Mark Zilis (2009) says, "...'Opipara' (or 'Bill Brincka') should be in every hosta collection...In the 1980s, however, I would not have given this plant such a glowing recommendation. Nearly every plant of 'Opipara'...in the United States was infected with a virus (probably Hosta Virus X). Fortunately, Bill Brincka... obtained a clean selection of this plant, which was marketed under his name..."
RE: H. 'Koryama' - According to The Hostapedia by Mark Zilis (2009), "When I first encountered this plant in the 1980s, it was purported to be a dwarf-size Hosta opipara, listed as Hosta opipara 'Koriyama'. A lot has changed since that time. Hosta opipara is now considered a cultivar (H. 'Opipara') and 'Koriyama' is the proper spelling for the plant (named for a mountain in northeastern Japan). More importantly, 'Koriyama' appears to be the same as 'Mishima Fukurin Koba', a form of Hosta sieboldii!" RE: H. 'Bill Brincka' - Mark Zilis (2009) states, "...represents a virus -free version of 'Opipara'. Most 'Opipara' specimens in the U.S. were infected with a virus (probably Hosta Virus X) before Bill Brincka imported this clean plant from Japan. By whatever name, the plant is simply magnificent." An Editor's note in The Hosta Journal (2010 Vol. 41 No. 1) states that, "H. 'Bill Brincka' is a selection of 'Opipara', but without the virus that plagues many 'Opipara' plants. When Bill Brincka brought his fabulous leaves of the plant he called 'Bill Brincka' to the National Convention of The American Hosta Society Hosta Show in Jackson, Michigan, in 1988, it had been feared that all 'Opipara' plants were virus-infected, but his clearly was not." A Photo Essay article by Steve Chamberlain in The Hosta Journal (2010 Vol. 41 No. 1) makes comments about H. 'Bill Brincka', " William Brincka registered this selected clone of 'Opipara' in 1988. Although it has leaves of a size appropriate for a medium-sized hosta, it is strongly stoloniferous (Mr PGC - Hostas are rhizomatous) and forms a very large plant as it matures. The shiny green leaves emerge with a bright yellow margin that slowly lightens to white as the season progresses..."